Jeremy Scahill is the author of the international bestseller Blackwater: The Rise of the World’s Most Powerful Mercenary Army (Nation Books). He is a frequent contributor to The Nation magazine and a correspondent for the national radio and TV program Democracy Now! He is currently a Puffin Foundation Writing Fellow at The Nation Institute. Scahill has won numerous awards for his reporting, including the prestigious George Polk Award, which he won twice and Project Censored Awards. He is also the winner of the Izzy Award, named after the muckraking journalist I.F. 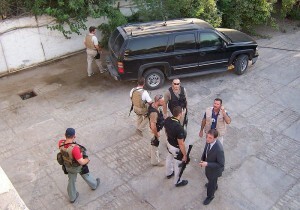 Stone, for his reporting on Blackwater since his book in 2007. While a correspondent for Democracy Now!, Scahill reported extensively from Iraq through both the Clinton and Bush administrations. 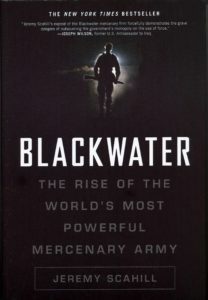 Traveling around the hurricane zone in the wake of Katrina, Scahill exposed the presence of Blackwater forces in New Orleans and his reporting sparked a Congressional inquiry and an internal Department of Homeland Security investigation. He has appeared on ABC World News, CBS Evening News, NBC Nightly News, CNN, MSNBC, PBS's The NewsHour, Bill Moyers Journal and is a frequent guest on other radio and TV programs nationwide. Scahill also served as an election correspondent for HBO's Real Time with Bill Maher. He lives in Brooklyn, New York. 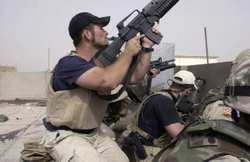 Will the mammoth contractor be forced to pay the U.S. government $400 million because they violated military policy by hiring Blackwater to provide security for them rather than the military?